The Little House of Concrete Bookshelves: Andrea Camilleri "The Age of Doubt"
Andrea Camilleri "The Age of Doubt"
Given the fact that Andrea Camilleri usually starts a new Montalbano story around dawn, long term readers will hardly be surprised to learn The Age of Doubt kicks off in the wake of a ferocious overnight thunderstorm that has sent waves over Salvo Montalbano’s front porch and washed out the road into town. Montalbano’s been jolted into consciousness after a dream about his own death. Entering the station to inform Catarella that he's off on a surprise trip to visit Livia in Genoa, he’s told he can’t go because he’s dead, and can’t investigate the case because he's too personally involved. Such nocturnal ramblings are never comforting affairs, and Salvo, as he goes about his morning routine, spends his time musing on the significance of the long-suffering Livia’s refusal to attend his funeral. She’s apparently got other, more significant demands on her time. Chivalry isn’t dead as far as Montalbano is concerned, and after identifying himself as a police officer he persuades her to join him, first in his car, then to change her clothes and dry out at his villa. There he learns her name is Vanna Digiulio, and she tells Montalbano she was on her way to Vigàta harbour to see her aunt, whose luxury yacht was due to arrive that day. The yacht, coincidentally, happens to be named the Vanna. Given the weather conditions the yacht doesn’t dock until much later than the ten o’clock E.T.A. and when it does dock it’s carrying the disfigured body of a man, face bashed in so he can’t be identified, they’ve collected from a dinghy adrift near the harbour mouth. That’s an obvious case for the local constabulary, and when Montalbano questions Livia Giovannini, the imperious signora who owns the Vanna, it turns out she doesn’t have a niece. Given the fact that Salvo’s been harbouring suspicions from when the supposed niece appeared on the scene something definitely smells fishy and as he sets about sniffing out the details he meets Lt. Laura Belladona of the Harbour Office, young, attractive and very much on the ball. Montalbano, surprise, surprise, is instantly smitten and, interestingly, the attraction appears to be mutual. The key to the case seems to lie in getting somebody on board the Vanna to investigate what’s going on under the surface, and since the owner case proves to be something approaching a ravenous nymphomaniac Mimi Augello, whose wife has conveniently gone to her parents’ place, is just the man for the undercover under the covers work. 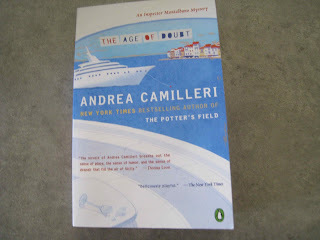 That’s about as far as one can go without letting one of several cats out of the bag, but in The Age of Doubt Camilleri has once again delivered an interesting well-paced mystery the usual linguistic mangling from Catarella and the rest of the supporting cast doing their regular thing as Montalbano goes on his merry way. Given the other female involvement there’s not much Livia this time around, but pathologist Dr Pasquano makes his appearance in the usual manner, Commissioner Bonetti-Alderighi is his usual pain in the backside self, though Salvo has managed to find ways of returning the anguish his boss delivers (there’s a wonderful little interview where Bonetti-Aldigheri is driven to the verge of insanity by Montalbano the walking Thesaurus). Dr Lattes’ regular inquiries as to the welfare of Montalbano’s non-existent family produce the news that a little boy, grievously ill in one conversation has passed on in the next and in turn provides the means to avoid signing a mountain of paperwork recreated to replace what had been water-damaged when the roof of Montalbano’s office sprang a leak during the thunderstorm. It may be titled The Age of Doubt, but there’s no question that Camilleri has, once again delivered a highly enjoyable and well paced mystery with all the elements long-time fans have come to know and love. The English translation of next title in the series, La danza del gabbiano (The Dance of the Seagull) is due in February 2013.